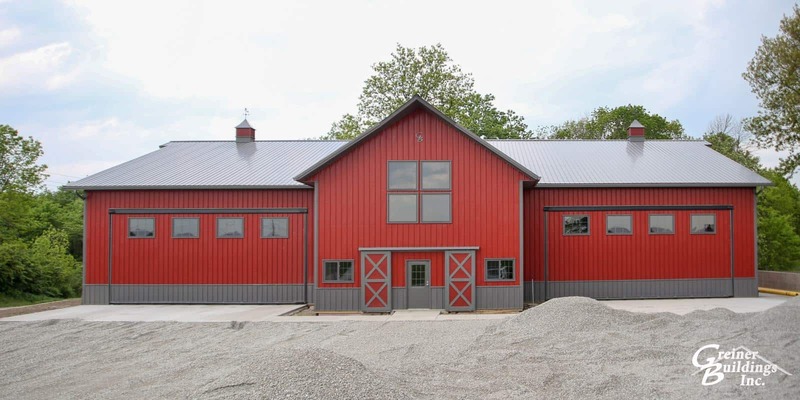 Homestead, Iowa Post Frame Machine Sheds | Greiner Buildings, Inc.
Greiner Buildings is your number one post frame and pole barn builder in Homestead, Iowa. We can construct anything from custom homes to agriculture buildings, horse stall barns, cattle buildings, hobby shops, storage units, machine sheds, equipment storage buildings, and more. Machine Sheds and Lined and Insulated Shops built by award winning Greiner Buildings, Inc. Greiner Buildings services Iowa and Illinois, including communities of Iowa County. If you are looking to build in Conroy, Homestead, Ladora, Marengo, Middle Amana, Millersburg, Parnell, South Amana, or Williamsburg give Greiner Buildings a call for your free quote! We also provide General Contracting and Project Management services, Building Repair, and 2D/3D CAD Design. For all of your steel building, hoop barn, or post frame building needs in Homestead, Iowa, call Greiner Buildings today. Our company has earned a fantastic reputation over the past 25 years for our quality structures and great customer service. We are experts in customization and can create any type of building that you can dream up. We have earned numerous awards for our specialty buildings. Take a look at our testimonials to see what our customers have to say about us! Trust Greiner for all of your building construction and repair needs in Homestead and Iowa County area. We offer free estimates to all potential clients in our service area. Call us today to get started. We look forward to working with you! Are you looking for firm pricing or budgetary estimates? Will some or all of the building be insulated? Would you like any porches, awnings, or lean-to's included? Are you looking for a general contractor to provide turn-key services? Approximate square footage of the building? Will the building be insulated? Will site preperation need to be included in our bid? Do you currently own the land you plan to build on? Farm and Ag Machine Sheds, Lined and Insulated Shops, SHOMES, Commercial Buildings, Garages, Man Caves. Washington, Clive, Kewanee, Quad Cities, Muscatine, Burlington, Des Moines, Ankeny, Winterset, Cedar Rapids, Iowa City, Solon, North Liberty, Mount Pleasant, Fairfield, Pella, Tipton, Williamsburg, Newton, Keota, Sigourney, Hiawatha, Marion, Columbus Junction, Wapello, Oskaloosa, Knoxville, Marshalltown, Altoona, Urbandale, West Des Moines, Bettendorf, Davenport, Ames, Kalona, Riverside, West Liberty, Princeton, Geneseo, Galesburg, LaSalle, Dixon, Rock Island, Moline, Wyoming, Sterling. Yes! I would love to see more of Greiner Buildings work and get regular building tips!